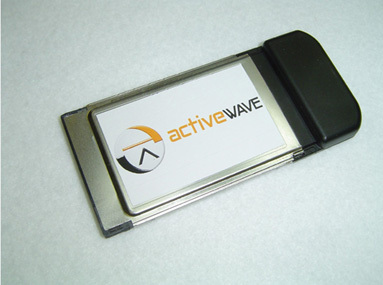 The ActiveWave PC-Card Reader connects directly to a Host computer's PCMCIA port to monitor and control the RF side of the system. The Host can be a PDA, laptop, or even Tablet PC. The PC-Card Reader is essentially a minituarized version of the ActiveWave Standard Reader with a PCMCIA connector. Besides the physical size and Host interface, the only other functional difference between the two Readers is that the PC-Card Reader does not have any input contacts or output relays. The PC-Card Reader receives all RFID data transmitted by a tag. It deciphers this data and sends the information in real-time to the Host. Depending on the application, the Host can use this information to control access to restricted areas, quickly find assets in a facility, or update inventory counts in a warehouse. When searching for specific items, the PC-Card Reader can turn on optional tag LEDs and buzzers to make finding items much easier. Along with the rest of our products, the PC-Card Reader was designed for easy setup, configuration, and use. When the Reader is connected, it will automatically be recognized be the Host. When the Host application sends a general reset command to the Reader, the Reader will respond with a power-up message to the Host. This message contains the Reader's address which can be changed by the user. Optional colorful LEDs on the PC-Card conveniently indicate the Reader's operation at all times. Two RF frequencies are used by the Reader to communicate to the system. The Reader transmits data using one frequency and receives data using a different frequency. This dual-frequency method allows for fast and reliable full-duplex communications. Traditional method of Access Control, Asset Tracking, and Inventory Control are limited and outdated. Access Control methods range from security guards to employee badges that must be swiped or placed close to a passive RFID proximity reader. Tracking methods are either entirely visual - dependent on security guards or surveillance cameras - or too costly such as GPS. Inventory Control methods require much money for complex enterprise software, and much more time and manpower for physical counting. Barcode scanning requires line-of-sight, close distance, and clean, undamaged barcode labels. None of these traditional methods offers a solution that is completely hands-free, automated, reliable, and that can save your business thousands. Indicators (optional model) RF LED On while receiving packet from tag.